MEMPHIS, TN – The Memphis Juneteenth Urban Music Festival is celebrating 25 years of fun-filled, musical merriment Friday through Sunday, June 16-18, on the grounds of the historic Robert R. Church Park on “World-Famous” Beale Street. Juneteenth, the longest-running cultural festival in Memphis, is the go-to place for eclectic music. This year, the legendary Barkays is partnering with Juneteenth on June 16 for a night of live, funk and soul music at the Cannon Center for the Performing Arts. ConFunkShun, another local legendary group, will join the Barkays in concert. The doors will open at 8 p.m. and the concert will follow at 9 p.m. The masters of funk will lead off with a syncopated beat at the Cannon Center. Music will continue to reverberate throughout the park each day, where more than 40,000 visitors are expected to attend the three-day festival. There will be plenty of entertainment, music, food, games, vendors, a car show, play rides, bouncers for the children and much more, said Franklin, who expects to thrill revelers with a heaping of cultural excitement. “After 24 years of teaching young people, seniors and the entire community about the history of Juneteenth, coupled with three days of fun and excitement in a park setting, we expect this year’s festival to be our crowning achievement,” Franklin said. Two of the festival’s signature events are the Memphis Juneteenth Youth Awards, which commences Thursday, June 15, at 6 p.m., and the Memphis Juneteenth Lifetime Achievement Awards, which follows at 7:45 p.m. Both events will be held at the Holiday Inn University of Memphis, 3700 Central Ave. The festival begins Friday and ends Sunday, June 16-18, 10 a.m. – 2 p.m. Each day is Kid’s Day Out, which coincides with the festival’s family-friendly mantra. The youth are integral to Juneteenth, Franklin said. On Saturday, June 17, from 1 p.m.-3:30 p.m., the Youthteenth Majorette Showcase will unfold, featuring cultural dancing from hip-hop to majorettes to cheer and drum lines to the sassy moves by some high-stepping seniors. Saturday is jam-packed with other activities as well, including the “best of the best” Car Show and a Veterans 5K Walk/Run starting at 8 a.m. and presented by Operation Stand Down Mid-South. Also, during the day, a 1,000 Fathers March will take place. 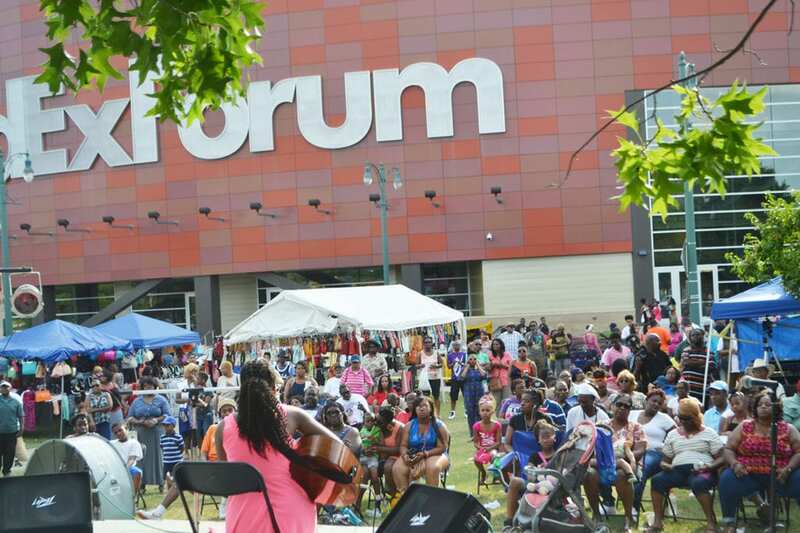 Sunday, June 18, is the last day for Juneteenth revelers and the set-aside day for Praise Fest at Memphis Juneteenth, featuring gospel music, inspirational words, and more. Some of Memphis’s most talented choirs, artists and celebrated musicians will take the stage. Juneteenth is a national holiday in the United States, which commemorates the abolition of slavery and the freeing of the last African-American slaves in Galveston, Texas, on June 19, 1865. The commemoration began in Memphis 25 years ago. Franklin said ever since the onset of the festival, Memphians near and far continue to revel in the music and enjoy the park’s family-friendly atmosphere.